I’m paying for my winter of inactivity… ouchy. Three people. Three horses. Three dogs. I think we probably all need advil, or bute, or aspirin. I’m gonna go grab mine… Lucas has already had his. Panama and I are slow… especially since Panama actually humped up on me, that dirty rat! 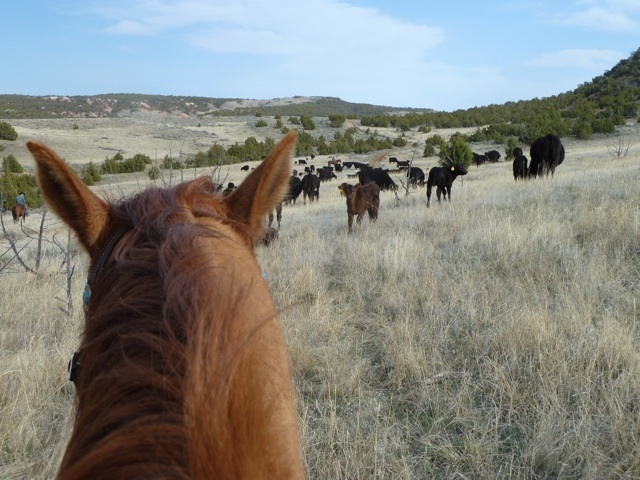 We were going to turn a cow back into the bunch and his head went down and I thought, “wha-?” and the hump appeared and I changed to “&^%$#$, don’t you try and buck me off!” Only his second time out this spring and he was feeling good, I guess. Daniel did a zillion times more work… he zooms… I jog. I get the job done most of the time, just not in a speedy way! Just look at all that grass!